Edmund Capon, Parallel visions: works from the Australian collection , 'John Brack / Jeffrey Smart', pg. 116-127, Sydney, 2002, 124 (colour illus. ), 125 (colour illus., detail), 146, 147. Bruce James, Art Gallery of New South Wales handbook , 'Australian Collection: Painting and Sculpture', pg. 102-181, Sydney, 1999, 166 (colour illus.). Bruce James, The Sydney Morning Herald , 'Getting Smart', pg. 14, Sydney, 04 Sep 1999, 14s. This article appears in the Spectrum section of the newspaper. Barry Pearce, The world of Antiques & Art , 'Exploring hidden treasures in Parallel Visions', pg. 124-126, Bondi Junction, Jul 2002-Dec 2002, 125 (colour illus.). Barry Pearce, Australian art: in the Art Gallery of New South Wales , 'The enduring image', pg. 265-266, Sydney, 2000, 272, 273 (colour illus. ), 302. Jill Sykes, Look , 'Breaking the territorial mould: some thoughts from a new head curator', pg. 30-31, Sydney, Sep 2011, 30-31 (colour illus.). 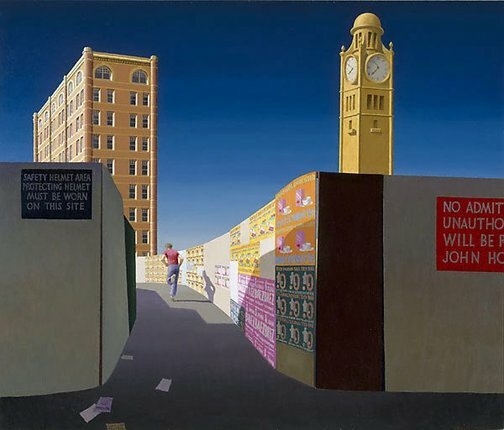 Jeffrey Smart , South Yarra, 1983, 113. cat.no. 631. Note that the title of this painting in this text is "Central Station 2", dated 1974. Cambridge visual arts: stage 4 , Cambridge, 2008, 35 (colour illus.). Jeffrey Smart , 'Seasons of Tuscany', pg. 11-23, Sydney, 2005, 21, 132 (colour illus. ), 186, 254. The swarm , Glebe, 2012, front cover (colour illus., detail), back cover (colour illus.). Christie's Australia - Australia and European Paintings. Melbourne, 27 & 28 April, 1999 , South Yarra, Apr 1999, 123. A study for 'Central Station' appears in this auction catalogue, cat.no. 132, oil on board, 29.4 x 32.4cm, painted in 1974, Est. $16,000-20,000. [NW 16/4/1999].